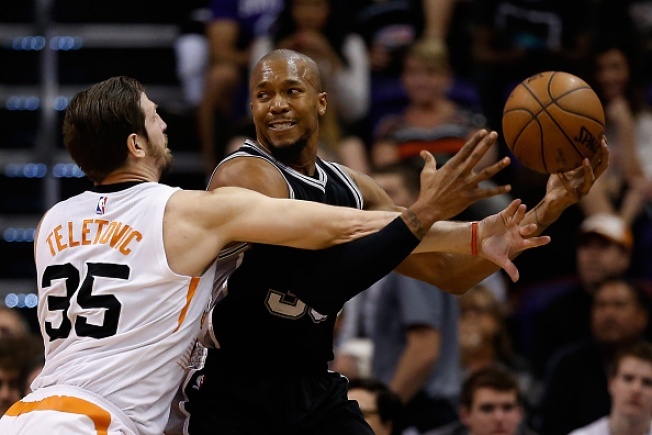 PHOENIX, AZ - FEBRUARY 21: David West #30 of the San Antonio Spurs looks to pass under pressure from Mirza Teletovic #35 of the Phoenix Suns during the first half of the NBA game at Talking Stick Resort Arena on February 21, 2016 in Phoenix, Arizona. The Warriors reportedly added another big man on Tuesday. David West agreed to terms on a one-year deal worth the veteran minimum, according to TNT's David Aldridge. He will make around $1.55 million in 2016-17. West averaged 7.1 points and 4.0 rebounds in 18.0 minutes per game with the Spurs last season. Last summer, West declined a $12.6 million player option with the Pacers, and signed a $1.5 million minimum deal with the Spurs. Back in mid-June, West declined his player option with San Antonio to re-enter free agency. On Monday, the Warriors and Zaza Pachulia struck a deal that will pay the center close to $2.9 million next year under the "room mid-level exception." No deals become official until the moratorium is lifted at 9:01pm PDT on Wednesday night. At this point, the Warriors' assumed roster consists of 11 players -- Steph Curry, Klay Thompson, Draymond Green, Kevin Durant, Andre Iguodala, Shaun Livingston, Zaza Pachulia, David West, Kevon Looney, Damian Jones and Patrick McCaw. Golden State has four spots to fill.